Make Your Dreams Come True (eBook) - Amber-Allen Publishing, Inc.
Have you ever wondered why some of your dreams are easily fulfilled, while others seem forever out of reach? Have you ever asked yourself these questions? When am I going to have what I want? Why do I struggle to move forward in my life? What do I have to do to make my dreams come true? 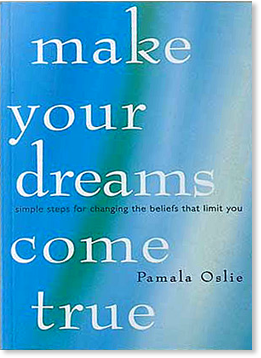 In Make Your Dreams Come True, Pamala Oslie leads you on an exploration of the thoughts and beliefs that unconsciously rule your life. With simple games and processes, you will learn to become aware of the beliefs that limit you. Then you’ll be guided through a comprehensive process for changing the beliefs that keep you from living your true potential. Any idea that you accept as truth is a belief. Your beliefs prompt your actions, expectations, and emotions, which then create your experiences. Thoughts that are repeated and reinforced each day become the basis for the repetitive behavior that creates the same results — again and again. Your life is a living picture of your beliefs. You won’t always get what you desire, but you will always get what you believe. If you want to know what you believe, take an objective look at your life. If you have a life filled with happiness, health, and love, your beliefs are working for you. If your life is filled with frustration, depression, lack, or struggle, your beliefs are working against you. It is time for us to move beyond “victim consciousness” and take responsibility for our own lives. It is time that we realize we are not at the mercy of events that happen to us. This is not to be unsympathetic or harsh toward people who suffer hardships, but to empower them to see that if they have problems in their lives, they can also create love, peace, health, abundance, and harmony just as easily. When we suffer from hardships and challenges, we don’t need to criticize ourselves for the life we have created. We simply need to acknowledge our part in creating these conditions and then choose to create something better. The more we become aware of our creative abilities, the more we will know that our choices are unlimited. If we are not aware of our creative power, it will appear as though we have no choices. It will seem as though we are at the mercy of circumstances beyond our control. We have the power to choose what we will think about and therefore what we will create. We can choose to think about our problems and our fears, or we can choose to think about our joys and our blessings. We can choose to think about reasons to be happy, or we can choose to think about reasons to be unhappy. We also assign value and significance to different events and circumstances. We decide what will make us happy, sad, angry, or fulfilled. If we have a belief that certain events and situations will make us happy, then when those situations occur, we will experience feelings of happiness. Some people believe that marriage provides a sense of security, which makes them happy. Others see marriage as a prison, which makes them unhappy. Some people believe children provide joy, warmth, and comfort, which makes them happy. Others consider children a burdensome responsibility, which makes them unhappy. Some people believe life should be full of adventure and excitement; they want to challenge life and explore new horizons. Others prefer a life of solitude and quiet reflection; they want a safe, secure, and comfortable existence. Everyone has a unique life experience because no two people have the same beliefs, desires, or perspectives. If you take the time to examine your thoughts and beliefs, you are likely to discover certain ideas that limit and hinder you. You can learn to let go of critical, fearful, self-judgmental thoughts. You can learn to trust yourself and your own inner voice. When you clear out the negative, self-limiting judgments, you free yourself to express your true creative power. Before you can change your limiting beliefs, you must first become aware of what they are. Start by listening to your inner dialogue. What repetitive thoughts are going through your mind? Are they fearsome, worried, and pessimistic, or are they joyful, optimistic, and enthusiastic? If you pay attention to your thoughts, you can discover your beliefs. There are no deep, dark inaccessible thoughts that are locked away forever in your subconscious. You have access to every aspect of your mind if you will simply be still and listen. Your emotions are another important clue to your beliefs because your emotions always follow your thoughts. If you are experiencing feelings of anxiety, worry, hopelessness, or depression, this is the first clue that a limiting belief is causing trouble. If you are sad or depressed, ask yourself what you have been thinking about or dwelling upon. Then ask yourself what beliefs might be responsible for generating these unhappy thoughts. Most of us allow the same habitual thoughts to wander aimlessly in and out of our mind. We have millions of thoughts every day, but most of them are identical to the thoughts we had yesterday. You can become aware of what you think and choose your thoughts consciously, or you can allow your mind and emotions to run wild and create unpleasant circumstances in your life. By consciously choosing your thoughts and beliefs, you become a conscious creator of your life. You become the master of your creations. Chapter Two: The Facts or the Truth?